Hydrangea Macrophylla are stunning flowering plants known popularly around the world. These Japanese native plants produce vividly coloured flowers that look marvellous contrasting over green foliage. Glam Rock is a magnificent Hydrangea variety that originates from Germany. It is a tough and fully hardy flowering plant that features multi-coloured flower heads that will truly transform your garden. Glam Rock produces attractive mop-head shaped flowers with pink-red petals that are tipped with lime green and surround a bright blue-purple centre. The flower contrast is so eye-catching, like a kaleidoscope, that it will make your guests wonder whether the flowers are real. The flowers change colours as they mature through the summer and the colours will vary depending on the supporting soil. Glam Rock will thrive in a well-drained soil that is moderately fertile and rich in humus. It prefers a sunny or partially shady location that provides shelter from cold winds. Provide a generous feed of fertilizer in spring to ensure healthy and brighter blooms. Glam Rock is a full winter hardy plant although it will appreciate a layer of organic mulch that will retain moisture. It is easy to grow flowering shrub that is extremely robust and demands low maintenance. 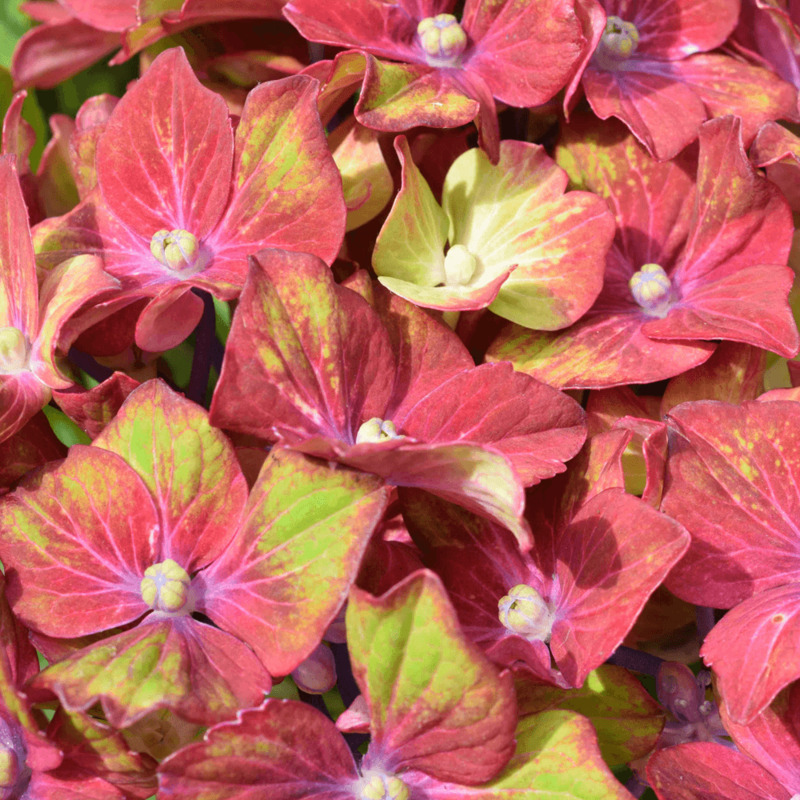 Hydrangea Glam Rock will look great in garden beds and borders. Use them in a garden container on a patio where it can show off its showy vibrant flowers. Its flower can be used in dried flower arrangements. This is not a plant that will sit idle in a corner. Glam Rock is a real show stopper, one that demands a special place in your garden.